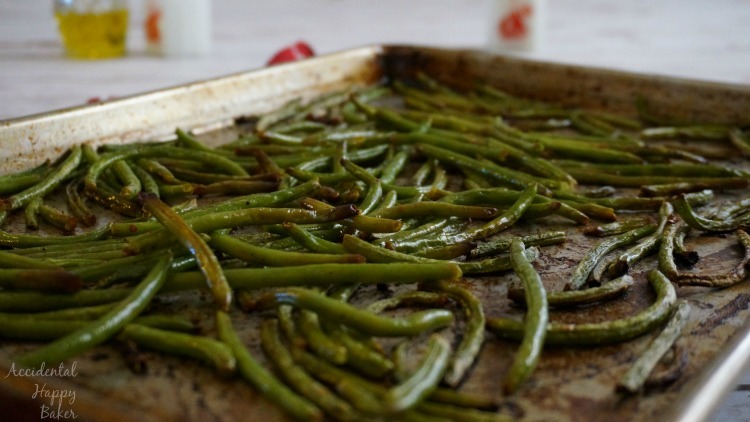 These roasted green beans are a quick and easy side dish. Livened up with soy and sesame, they are anything but boring old beans. Livened up with sesame and soy, these roasted green beans are a quick and easy side dish to add to your repertoire. I’ve been working on a new scone recipe this week; cherry scones. They taste delicious, the texture is right, light and moist, the cherry flavor permeates every bite, but the darn things are ugly…and, dare I admit it, greenish. The dough turns greenish after it’s baked! I keep tweaking the recipe and eating them everyday. Food blogger problems, LOL. At any rate, I decided to take a cue from fate and embrace the green this week, (though I’m not quite ready to succumb to the green cherry scones just yet). 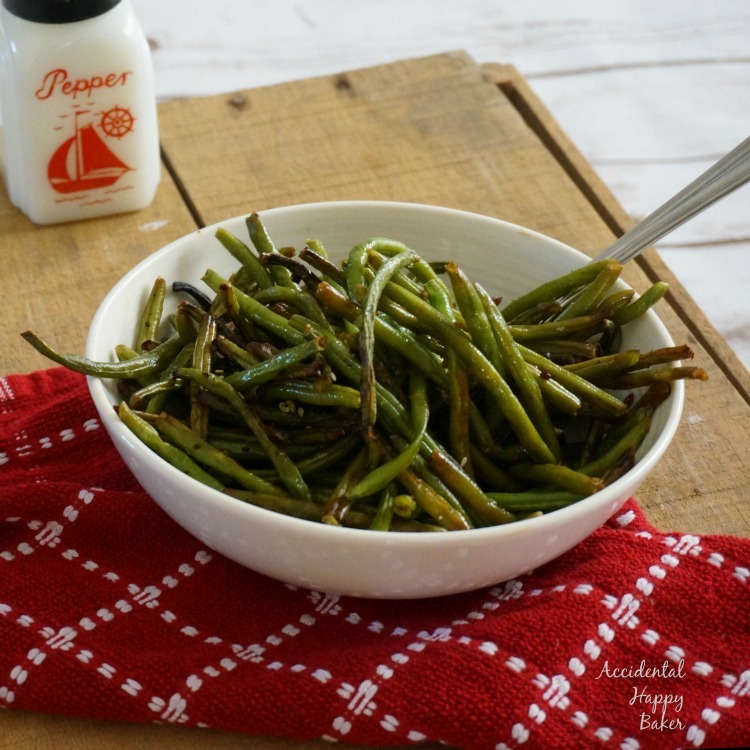 Instead I decided to share these simple roasted green beans which have been on my list to share for a while anyway. We eat green beans a lot, they are my #1 go-to side dish veggie. Although my household is very split over which preservation is best for green beans, I like frozen best while some of the others like canned. Let me interject here and say that I really love fresh, but they are so darned expensive. Frozen is usually the way we go because that’s what I like and I’m the one doing the shopping and cooking. And holla, they are often on sale and part of Hy-Vee’s fuel saver items which I love. These roasted green beans are a quick and simple way to liven up green beans. Tossed with a little sesame oil, olive oil, soy sauce, garlic and black pepper, they are then roasted in the oven. My kids love these beans. Basically my kids will eat almost any veggie if I put soy sauce on it. Is that weird? It seems kind of weird. We have to have rationed soy sauce because they go nuts over it. Anyway, the other day when I made these roasted green beans for this post, they came home and were raving over how good they smelled and were begging to eat them for their after school snacks. (I do most of my blog cooking in the afternoon right before they get home) Roasted green beans for an after school snack? Okay, yes, they’re a probably a little bit weird. I like to top these roasted green beans off with a good crack of black pepper and sprinkle them with sesame seeds. However, when I was made these the other day I didn’t realize until I was dishing them up that I had approximately 8 sesame seeds left in the jar. So if you can’t really see any sesame seeds in the pictures, or you can only spot like one sesame seed, that’s why! Now tell me, what’s the number one go-to side dish veggie in your house? Green beans are roasted with sesame and soy sauce for an easy weeknight side dish. Line a baking sheet with heavy duty foil and spray with non stick cooking spray. In a medium bowl, mix together the olive oil, sesame oil, soy sauce, and garlic. Add the beans and toss until well coated. Spread them evenly on the baking sheet and bake at 425 for 20 minutes or until the edges of the beans are just browned. Season to taste with fresh cracked black pepper and garnish with sesame seeds if desired. 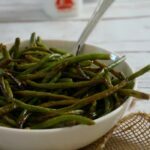 I already ate dinner, but I love green beans and these are so on my list to make for dinner tomorrow night! I’m gonna add some bacon pieces with it. Bacon and beans is a favorite combo of mine. Doesn’t matter what kind of beans, I love them all. Except for Lima, that’s the only veggie I can think of that I don’t like. Roasted green beans are my favorite! So delicious and so easy! A good green bean is hard to beat. That’s what I say. They are my favorite too. These sound amazing though with all of the flavours! A great way to make them for everyone to enjoy!! I hate when food just doesn’t look pretty even after testing again and again. I had a recipe one time with artichokes and garlic and for some reason the garlic kept turning blue while it was cooking. BLUE! No bueno. 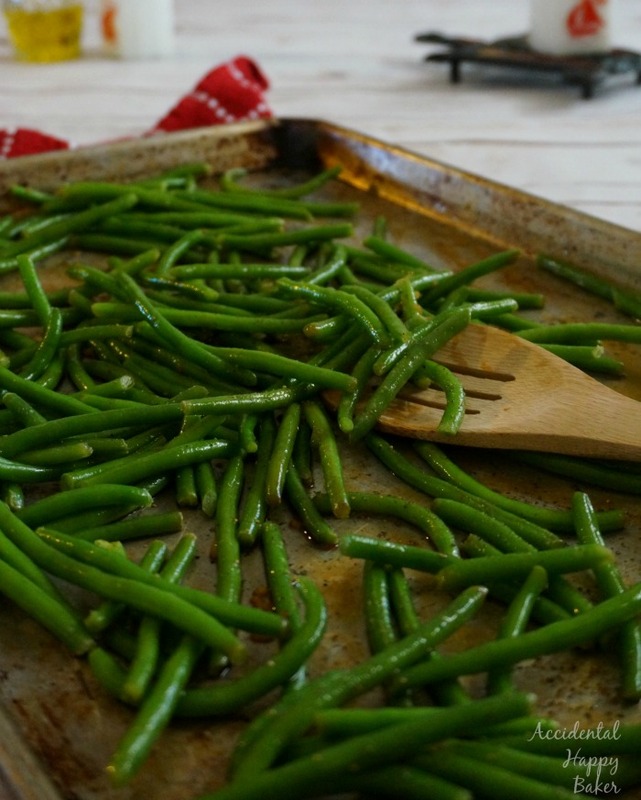 Anywho, we love green beans and these look like the perfect side dish for upcoming holiday celebrations! Ah, I’m so glad there’s someone else out there that accidentally changes foods strange colors. Lol. You’re right, these will make a great and easy side dish perfect for the upcoming holiday season, Des.